Alright, listen. I have no idea what the actual name of this product is. 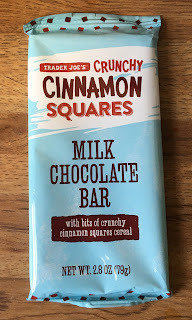 It might be Trader Joe's Crunchy Cinnamon Squares Milk Chocolate Bar. 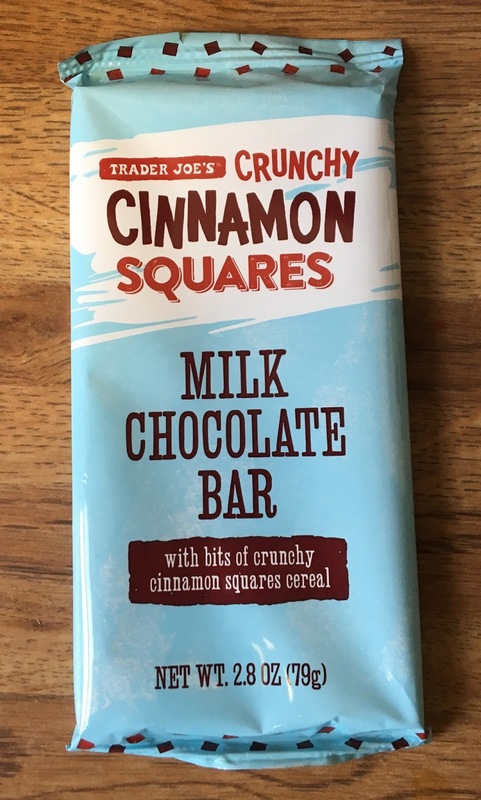 It might be Trader Joe's Milk Chocolate Bar With Bits of Crunchy Cinnamon Square Cereal. It also may be Trader Joe's Crunchy Cinnamon Squares Milk Chocolate Bar With Bits of Crunchy Cinnamon Squares Cereal. 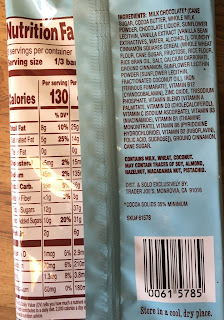 That last one is straight from the Department of Redundacy Department...but it is what the packaging of this particular candy bar suggests, isn't it? 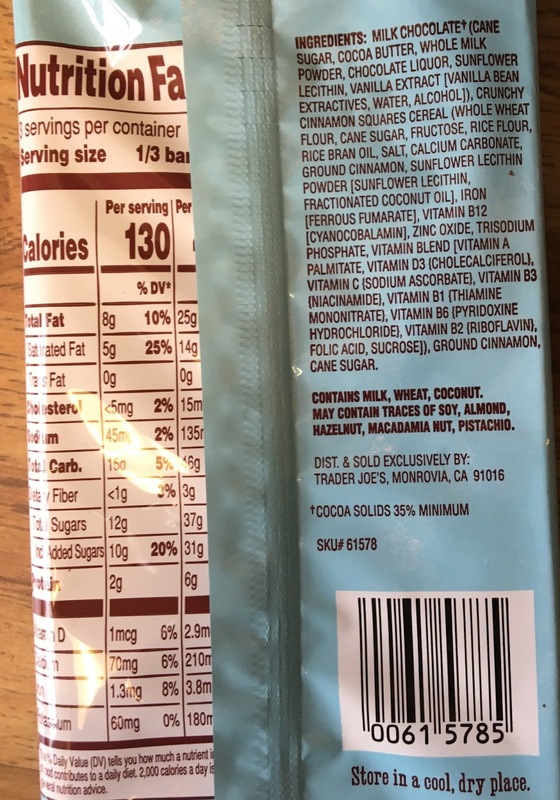 I guess, no matter the name, it's clear its from Trader Joe's, its a milk chocolate bar, and it has something to do with crunchy cinnamon square cereal as well. Well, dang it, count me in. Well, it's a pretty decent candy bar, though not without a flaw we'll get to here in just a minute. Unfortunately Sandy, the kiddos and I kinda devoured the thing before taking a better pic of the actual product, but it's a gridded up choco-bar, easily breakable into 24 pieces. So it's perfect for sharing with all sorts of group sizes. It all looks like a pretty normal Hershey's relative, save for a gritty, dusty undercoating of cinnamon and sugar. Taste..eh, typical milk chocolate. I prefer dark, mostly, but it's an agreeable enough base. The cereal chocolate bar definitely emphasizes the cinnamon, though - it's heavy. My first reaction was a little of a turnoff - seemed a bit strong, too soon, but by the end of my allocated portion I was just beginning to enjoy the overall flavor. The cinnamony bite is pretty balanced out by the choclate, and it makes for a fun flavor, not too much unlike Mexican hot chocolate. But there's a problem. I expected there to be cereal here. But...there isn't. The "bits of crunchy cinnamon square cereal" the packaging promised aren't there, at all. At the very least I would have hoped for something like a typical crisped rice/Nestle Crunch kinda deal, with lots of crunchies everywhere, if not big actual cereal chunks. Yeah, nope. The couple little specks of cereal here and there are few and far between and add nary a textural variant. It's kinda disappointing in that regard, so there's some mega point deductions there. Overall the bar tatstes about right, if you like cinnamon, of course. But it just doesn't feel right. There's just too much untapped potential here. For a couple bucks, the cinnamon cereal chocolate bar with cinnamon but not really cereal made an alright buy, but it's not a purchase I'd seek out to repeat over and over. Meh. I think maybe if they went with more of a darker chocolate route. It might work and also adding whole pieces of cereal squares would help too with the texture. I must have gotten one from a different batch - there were a lot of "bits" of cinnamon cereal (as if it were crushed) throughout the whole bar. And I didn't find the cinnamon strong at all. I really liked it. My husband says it tastes like Apple Jacks! I agree. He likes it quite a bit-me, just so-so. Just found your blog. Love it. Saved me from buying the veggie pad thai...BUT wholeheartedly disagree with this one. As you mentioned, it tastes like Mexican hot chocolate...I love eating that in its Abuelita/Ibarra brick form but it's way too hard to bite off and chew as a snack (hurts the teeth after a couple bites), so this is perfect. However, I'm also milk > dark, so perhaps this is where we differ. I will say though, the packaging probably shouldn't use the word "bits" of cereal, more like a crumble.